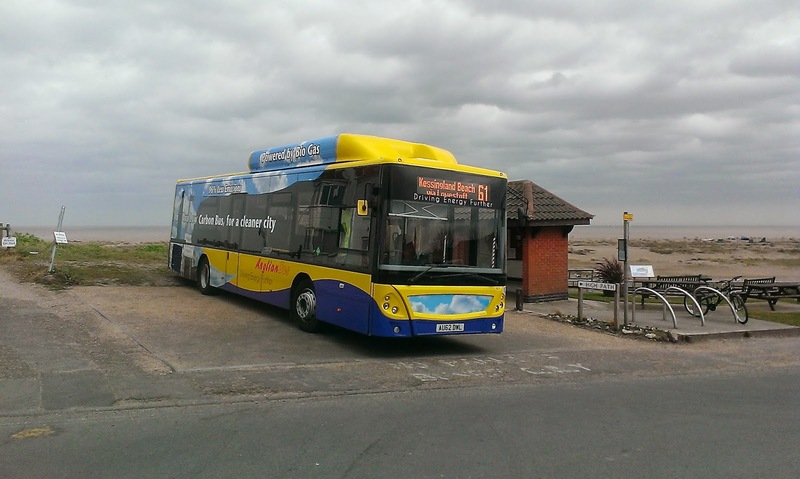 Today saw Borderbus take over the 521 between Halesworth and Aldeburgh from Nightingales. Since the 521 is my closest regular bus route (I just don't count the 196 as a bus route) I thought I'd better get out there to sample the new genesis of the route. And so after some brilliant adjustment of my pick up time from Suffolk Links I got to Halesworth in plenty of time to catch the 1015 service to Aldeburgh. Used to Nightingales' Mercedes Beavers the passengers looked suitibly impressed at the gleaming new E200 Borderbus are using on the route - that's the paint gleaming on the outside and the plastic on the inside. 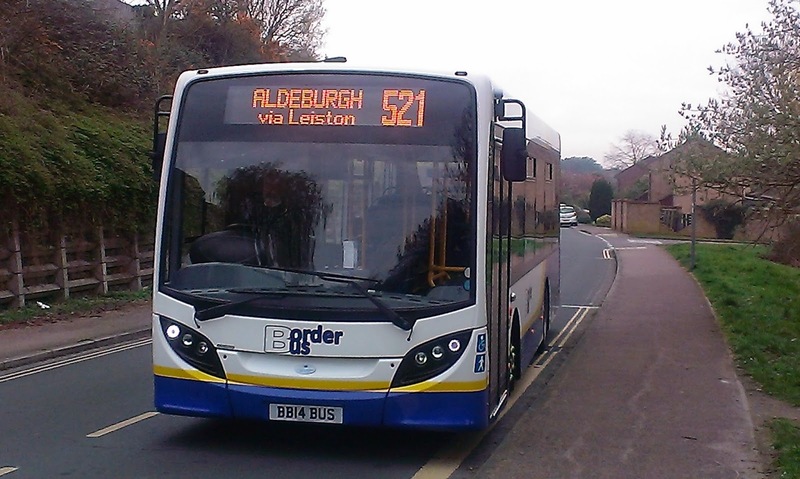 However it was on time, well driven, and the seats were comfortable, but by time it got to Leiston I had just about had enough of that whining engine and by time we got to Aldeburgh I couldn't get off it quick enough. That said there will be few long distance passengers on the route and for the purpose it serves it will be a great improvement on what went before. 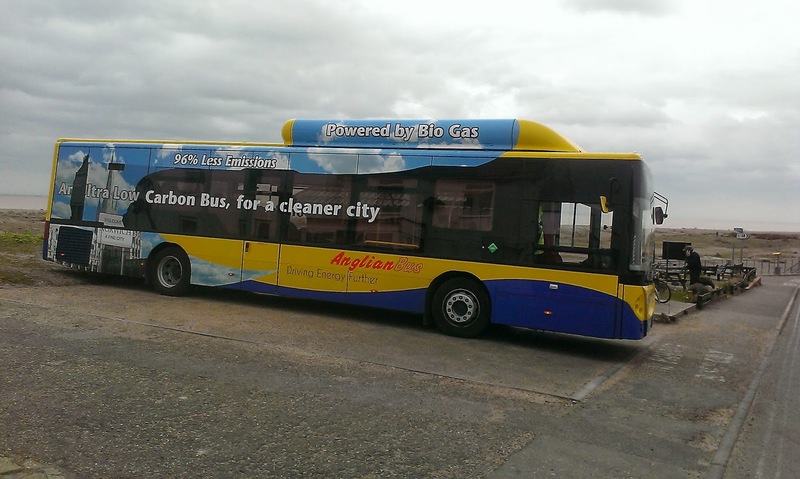 I wish Borderbus all the success in the world but wish they had bought a Streetlite instead! A new feature for SB&TP is a selection of pics I took during the past week that didn't make it to any of my posts. And finally for this week how often does this happen! 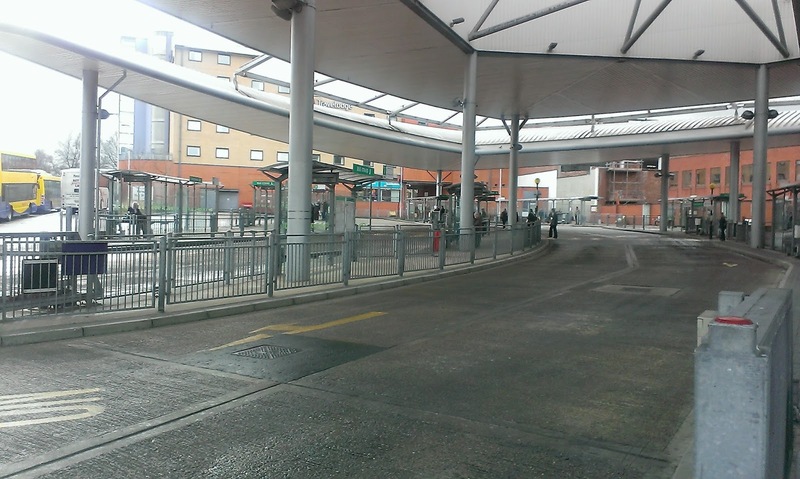 On Wednesday afternoon at around 1330 this was the scene at Norwich Bus Station. Within 20 seconds of taking this rather eerie pic there were 6 buses on the stands! 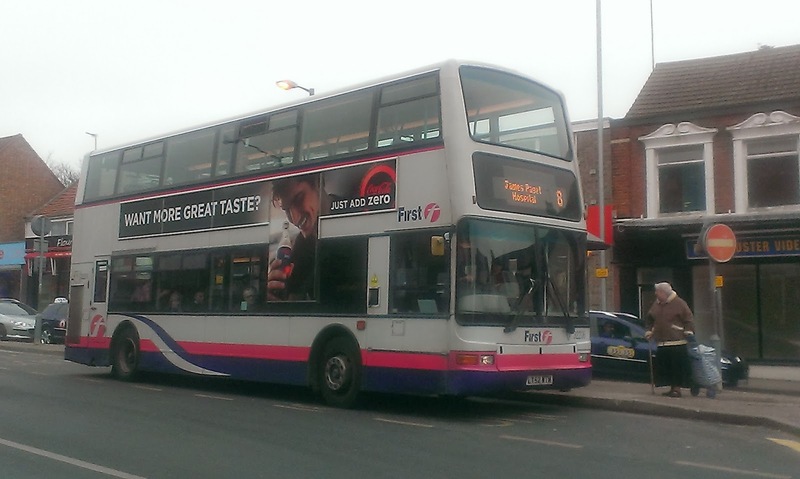 I have just received an email from Chris Speed, Business Manager for First Eastern Counties regarding the 3 between Yarmouth and Hemsby, and why it will not be RML operated this year. Basically it would appear the route is too successful, and it is taking a heavy a toll on the RML's - too heavy a toll. 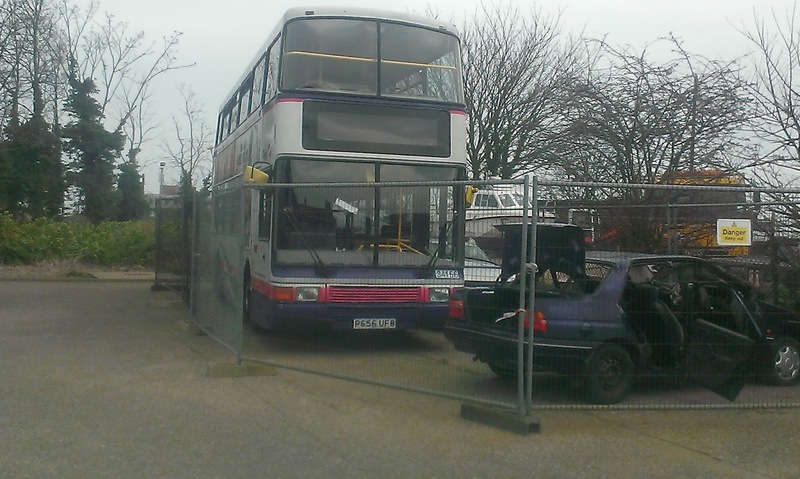 First are keen for the RML's to be available for the enjoyment of the people of Great Yarmouth for many years to come, and feel that to subject them to the workload of the 3 would prove too much for them with spare parts increasingly difficult to get hold of. There are going to be some advertsied RML weekends on the 3, so it won't be a complete absence this year. So that begs the question could the Summer fleet be expanded so the workload can be shared about - a couple of open top vehicles for sunnier and warmer days, for example. I'm sure a company the size of First can lay its hands on vehicles for that purpose and that would still keep up the attraction of the route, and just as importantly the revenue. President B7's just don't have that same attraction. Anyway we will see what happens and if there are anymore developments I'll post them as soon as I know them myself. 110 days ago the most damaging storm surge in living memory caused havoc along our coastline and rivers. Caught up in the floods in Lowestoft was single car unit 153314. Having discovered that she was a train and not a wading bird, dolphin or indeed ark and no use whatsoever as a sandbag it took some pretty serious repairs to get her back on track - literally. Yesterday she made her comeback and today I managed to get a pic of her, still in "One" livery at Norwich Station just about to leave on the 1136 to Great Yarmouth. 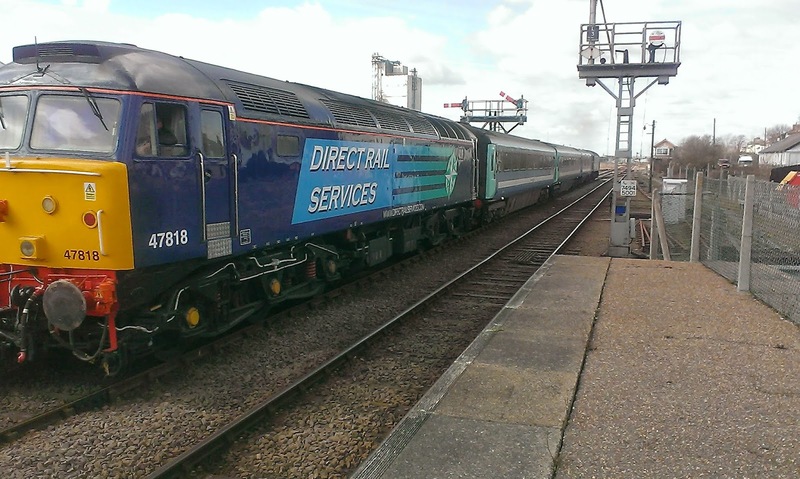 I also manged to somehow get a snap of what will be the new "short set" coaches in their siding at Norwich. Still no indication when they will be in service - the short set wasn't even out today! The pic was taken almost blind as that fence is very high and it was a miracle I got them at all! 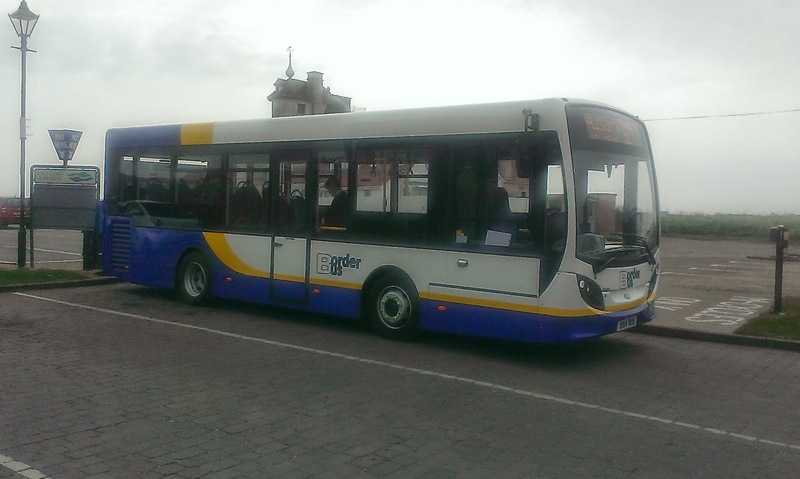 SB&TP can exclusively reveal the new vehicle bought by Borderbus for the 521's which they start next week. Unfortunately I have no registration but I have been informed it is an new E300, although looks more like an E200 judging by the length. 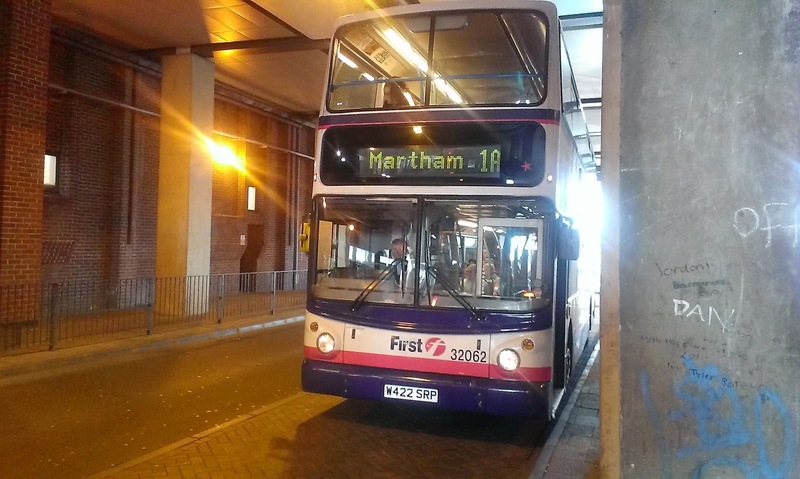 Anyway my thanks to Anglian driver Malcolm for taking the pic, who sent it to another driver Derek who passed it onto me. You are gentlemen and scholars and I thank you both. Not much to report today really. 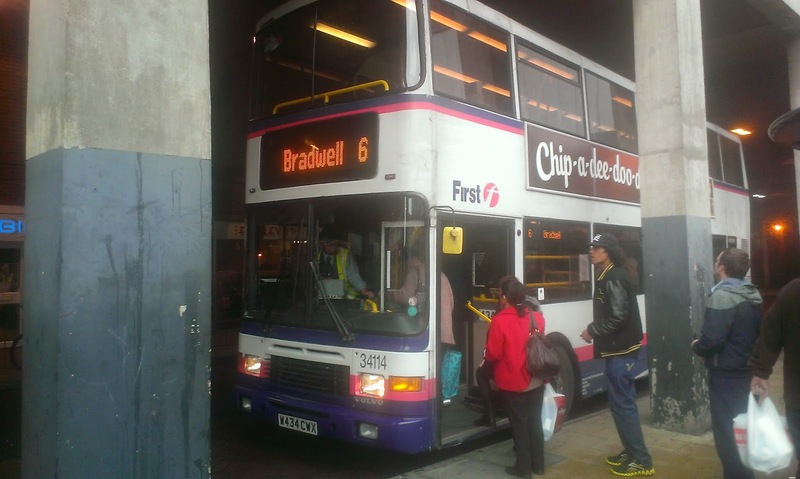 Incidents of note include a relatively decent journey on a B7 President. No I'm not losing it but 32214 gave quite a nice ride from Lowestoft to Yarmouth. Once there I noted an irregular working on the 81's. Optare Excel 229 is normally on the 81's so that didn't make it irregular but it's the first time I've seen an Excel on the 1410 departure. A bit pedantic maybe but I said there wasn't much of note today! Having checked out what was on the BM contract (37574 and 32205) I then decided to go to Acle and back as 33423 was waiting on the stand. Really nice driver who I'm sure Cameron will be able to identify, who waited at Acle for me to take the pic before a nice thumbs up! I cannot tell you how good those tinted windows were today! If you look in the top middle of the windscreen you will see the most enormous chip I've ever seen - looks like it's been shot! Surely a replacement screen soon. The idea was to catch the next X1 back hoping to get a shot of the short set on the Acle straight but it never showed up which blew that one. The 7 after was too late to catch it either. Oh well. In the sun at Acle. Still the most photogenic bus in the region I think. Seriously needs to go to Showbus. Finally when I got back I saw a genuine irregular working with Dart 42919 on the 8 to JPH - Cameron will like that one too! 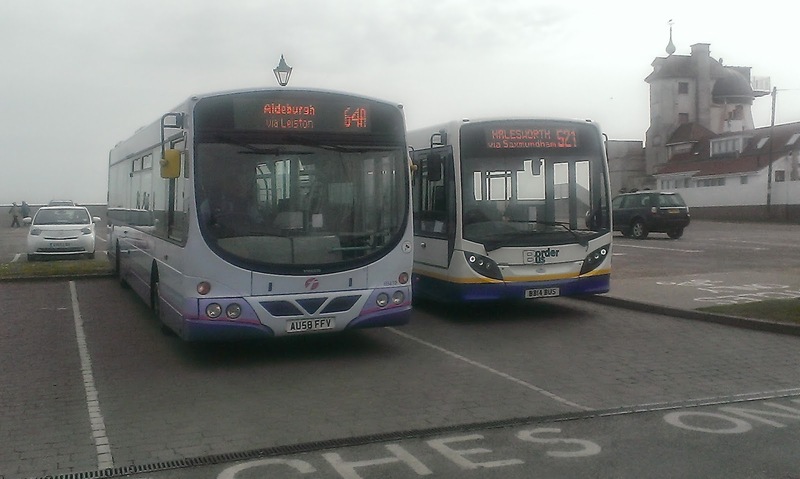 I'm off to North Norfolk tomorrow to pick something up so will be sampling the 55 and the 5 for the first time. 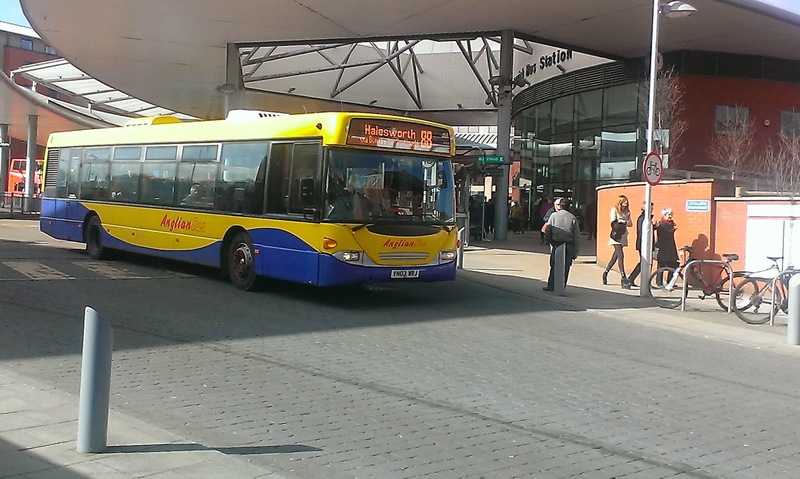 First of all Anglian and Konectbus have announced the changes to timetables coming into operation on April 20th. Nothing really major although interesting to note that Anglian's 7 is going to reduce its frequency to 30 mins between 1600 - 1800 from Norwich, just when it seems that their passenger numbers are rising. The 2A operated by Konect is being extended from Holt to Dereham, which would make a nice round trip from Norwich coming back on the 8. 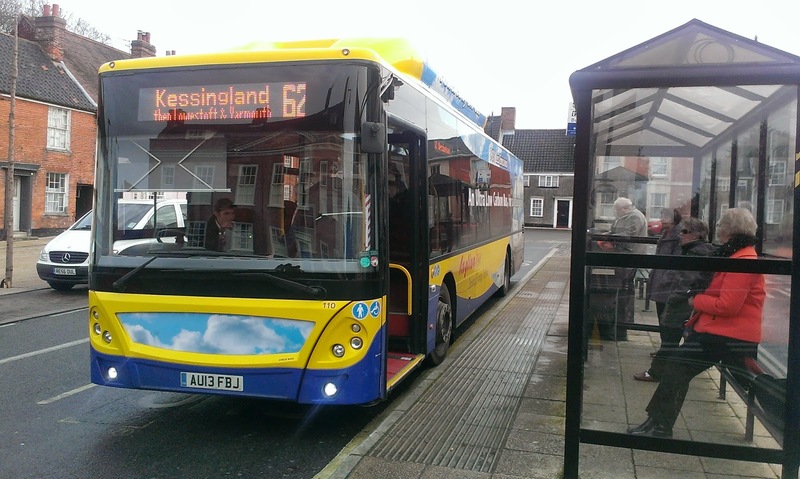 Anyway details of the Anglian changes can be found here and the Konectbus changes here. It would appear from various reports that Routemasters are not to be used on the 3 this year to Hemsby. Trust me, having proclaimed that journey as my "journey of the year" last year I'm not taking that lying down and I'm going to lobby First management as much as I can to have that decision reversed. Apparently the decision was taken as the RM's are step entrance. There are ways around that if the route is shared with low floor buses - or the 15 in London wouldn't be able to have RM's still running on it. Watch this space. 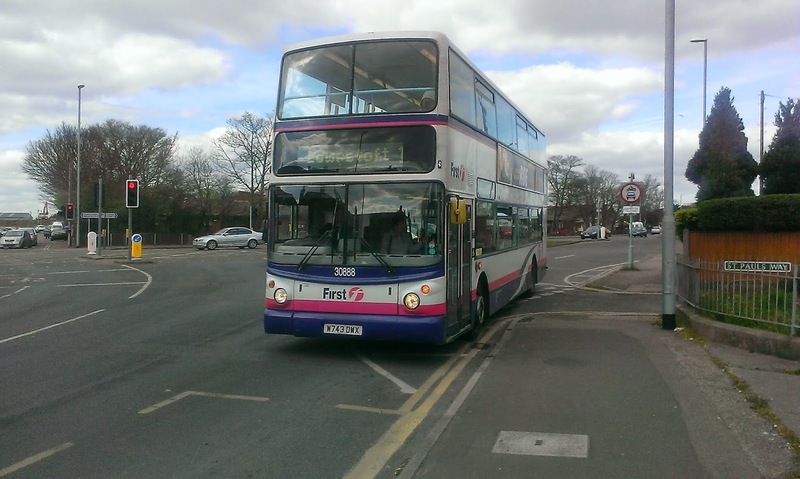 Yesterday I completed the set by travelling on ex First Leicester ALX400 32061. Not much to say except there is really nothing between them and they are what they are for their age. Good to see all 4 ALX400's on the 8 together though. ALX400 32061 X221 XBD at Market Gates. Sorry about the railings - the light was awful from the other side. I alighted at Gorleston Fire Station which I have been meaning to for weeks so I could finally get a couple of pics of 34156, now a crash test dummy, or something like that with Norfolk Fire & Rescue Service. There was no one on site to ask so I hope no one minds me publishing these pics. At least she is still serving a useful purpose. As I type I have only received 2 nominations for the favourite route poll I was intending to set up. That's rather disappointing as I was expecting a lot more, so come on folks, tell me your favourite route so it can be included in the poll. A community was in shock in Yarmouth yesterday after reports that a coach was actually parked in Beach Rd Coach Park turned out to be correct. A stunned resident told SB&TP " I don't believe it! 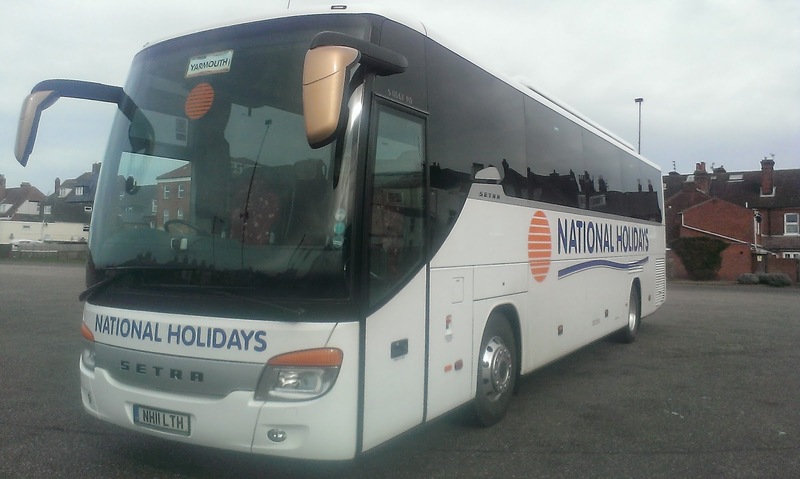 For months the coach park has lain empty and now out of the blue this happens, I'm not sure how long it will take for us to recover from this"
The offending coach belongs to National Holidays, based in Hull according to the legal lettering on the coach, a 2011 registered Setra. 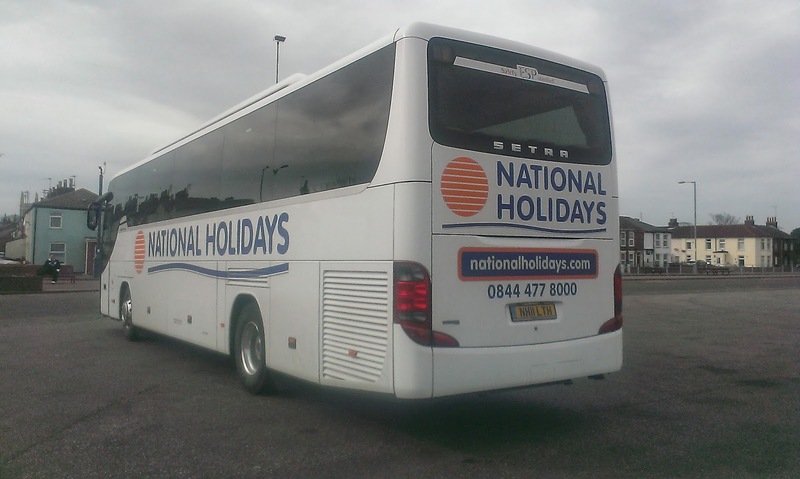 A source close to National Holidays said "It's unusual, but not unheard of for our coaches to use designated coach parks, rather than clogging up the roads outside small hotels. It would appear the driver must have seen a traffic warden approaching"
Other residents expressed concerns that as the warmer months approached other coaches might be tempted to use the coach park. One mum sighed "If that happens we'll have to send the kids to the beach to play instead"
Is it me or do those mirrors give a preying mantis look to it! I hope no one from National Holidays is offended by the above post - just a bit of fun and I was bored!! I actually thought she looked excellent, which is why I took 3 pics! Took a trip to a rather blowy Kessingland Beach today, and I think it makes quite a good backdrop. I think with a blue sky and bright sunshine some really good pics could be taken there, and I could be making the odd trip or two back there over the Summer. 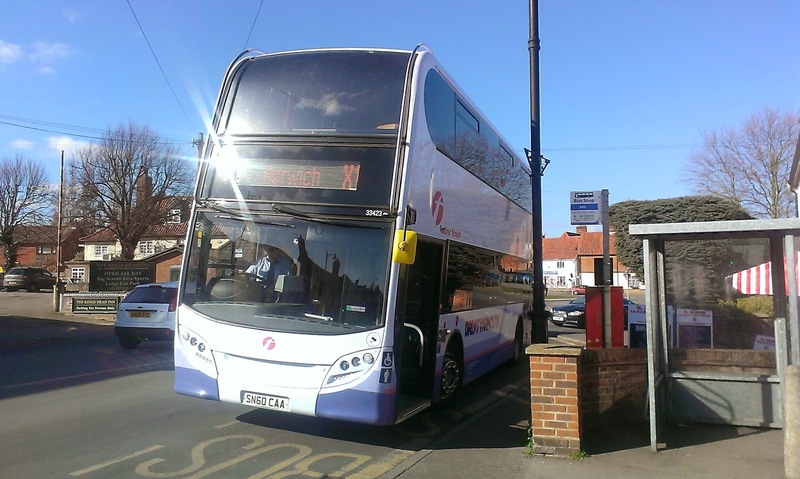 Anyway thanks to Anglian 107 WX62 DWL for giving the usual A1 ride and also just about the friendliest and most courteous driver you could wish for - not just to me but everyone - a really nice guy and a credit to Anglian. Well that was a good poll, and predictably tight. 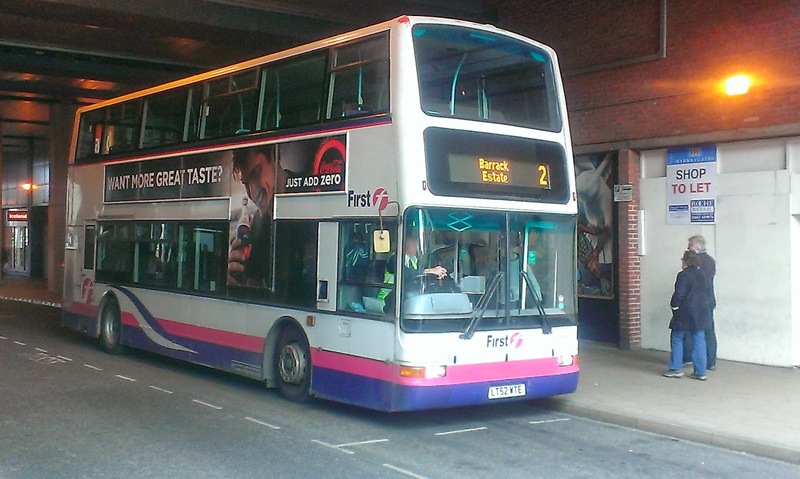 First Corporate and Norfolk Green came out on top, with Anglin one vote behind, and Ipswich buses new livery and rather surprisingly Excel X1 another vote behind Anglian. 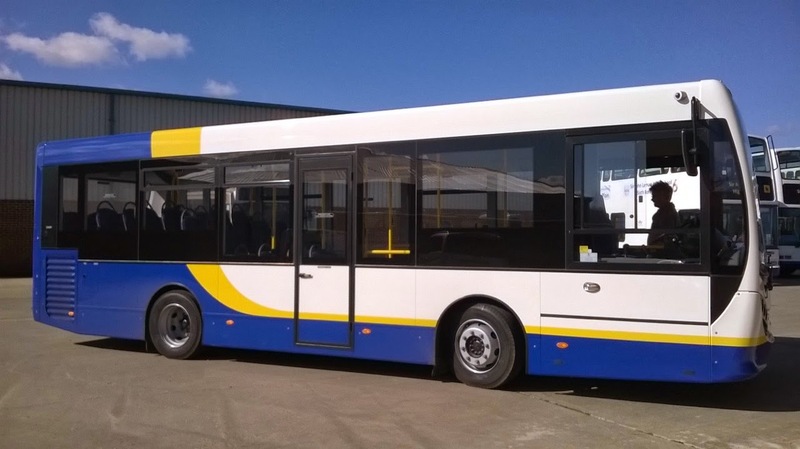 I'm quite pleased Norfolk Green shared top spot as I really like their new livery - anything that makes Optare Tempos look smart has got to have something going for it! No poll this week as I want nominations for favourite route, so send your nomination to me either in the comments (anonymously if you want) or by email and I'll include them all in a poll next week. Anyway here are this weeks winners. They Think It's All Over - Erm Actually It Isn't! I had the pleasure of meeting Ryan today at Caister Rd. Really good to meet you buddy, and if you continue to give me news like you did today you'll go straight to the top of my Christmas card list! We are fast approaching Easter, where a lot of people think about resurrections. Well there are going to be at least 2 resurrections at Caister Rd. Ryan informs me that 34111 is being prepared to re-enter service in the near future and remarkably this will be followed by 34114. 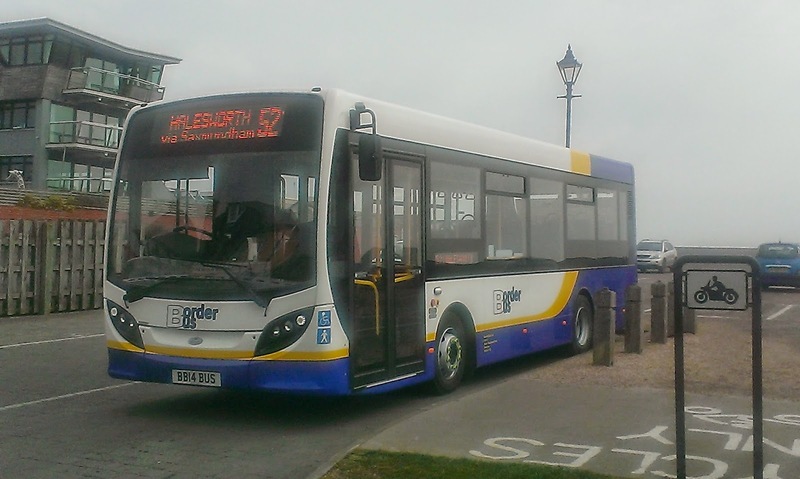 Lowestoft loanee Dart 42921 has returned to Yarmouth. PS will analyse poll tomorrow - 4 posts is enough for one day! All four of Yarmouth's ALX 400's were out today. 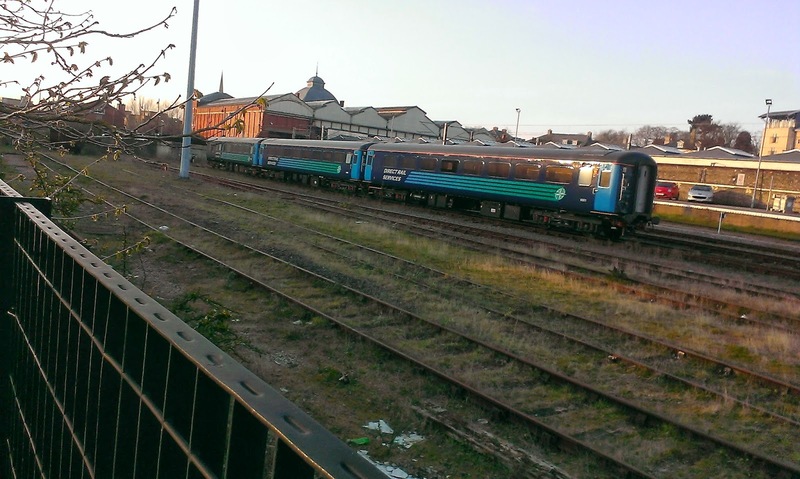 30888 and 32062/3 were on the 1/1A, and by a method of elimination I passed 32061 doing contract work later this afternoon but since I was downstairs and being royally deafened on an X1 E400 (dear God the NOISE) there was no photo opportunity. But I did ride on and photograph the other 3. No real distinction between them but the seats on 30888 are a joke! By the way I'm not going to identify the E400 I was on or when, as I asked the driver how they coped with the unbelievable rattles and noise in the cab area - seriously I have never heard anything like it, and he just looked to the heavens and said "we go on autopilot, mate, and block it all out". What a sad testament for a vehicle 5 months old costing £360,000. I saw two things in Yarmouth today I didn't think I'd ever see. Firstly an Olympian back on the X1 shorts. 34109 operated the 1205 to Norwich, which I missed due to stopping of to see the "short set" at Lowestoft. However I did manage to picture her on her return, only for my camera to stubbornly refuse to capture the destination screen, so you'll just have to take my word for it. 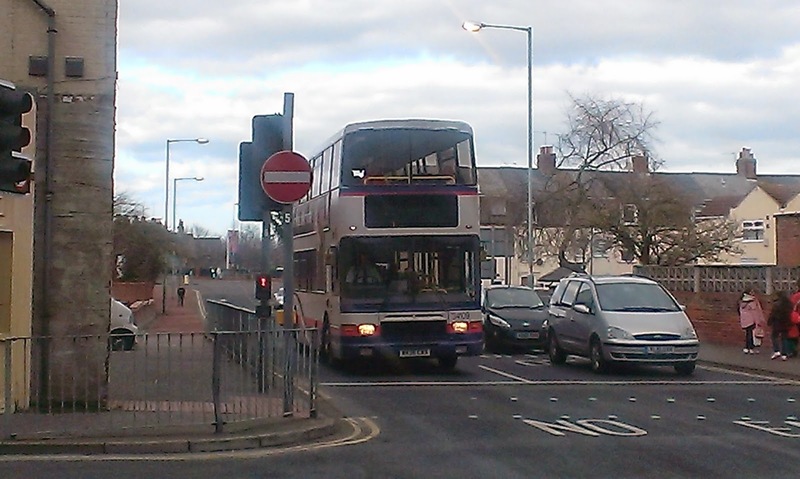 The second big double take of the day came when 32200 came in working to 2 to Barrack Estate. I have never seen a decker on that route before and perhaps those in the know can let me know just how often that happens! 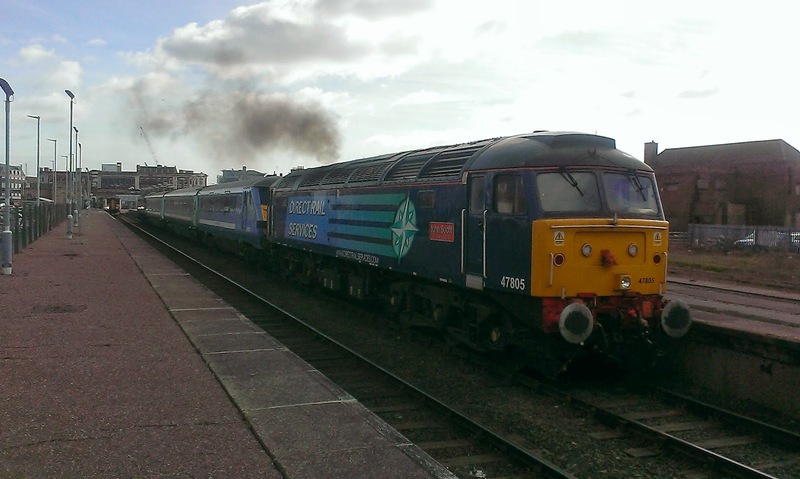 34109 returns to Yarmouth from Norwich. You will have to believe me that it really is showing X1 Great Yarmouth! 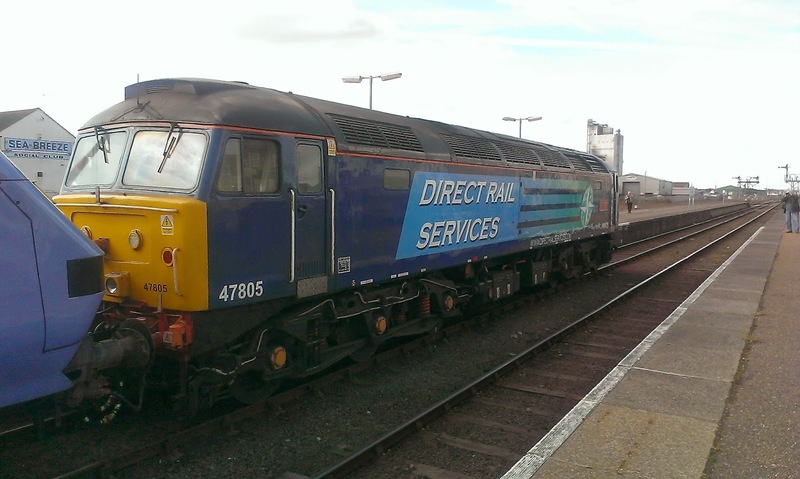 Stopped off at Lowestoft today to catch 47805 make its debut on the "short set". There have been a few choppings and changes over the last week, with 47810/813 and 853 all seeing action. 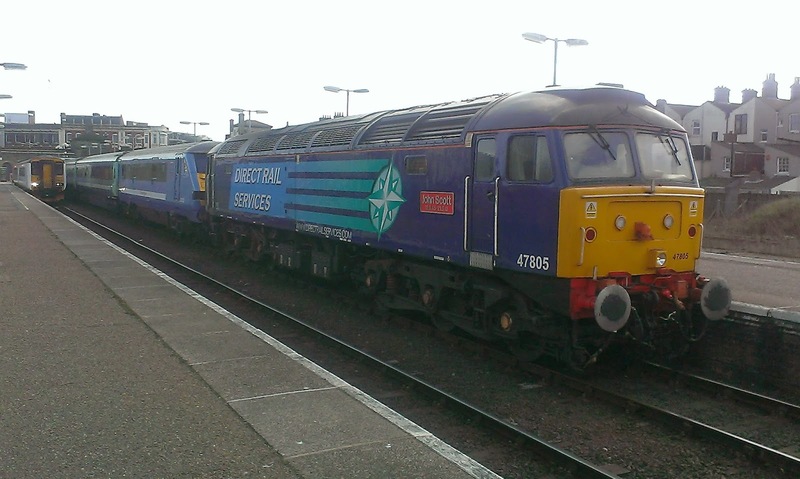 However today it was 47818 "Emily" at the country end with 47805 at the Norwich end. And quite a show she put on too - great soundtrack and some good smoke (sorry Greens)! 47818 "Emily" brings up the rear - the semaphore signals just add to it! 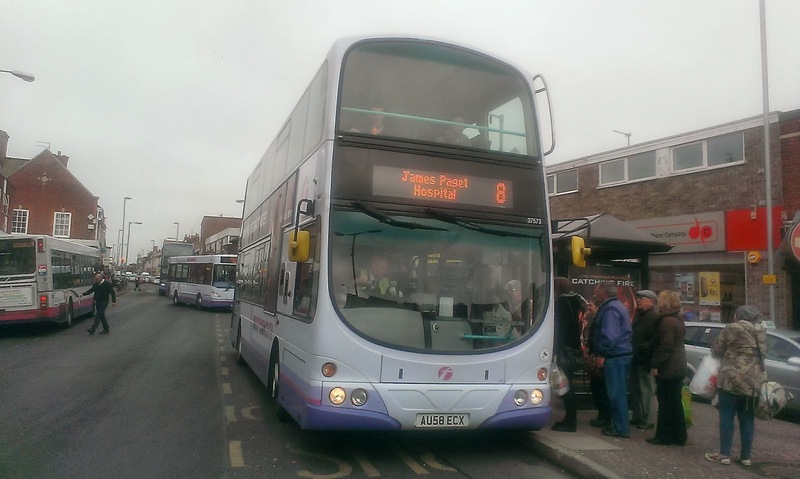 It has long been a gripe of mine that there was a gap of 4h 20m on weekday afternoons between buses on the 62 from Lowestoft to Halesworth (yes I know the route officially starts at Kessingland but we all know that's just to please Brussels). 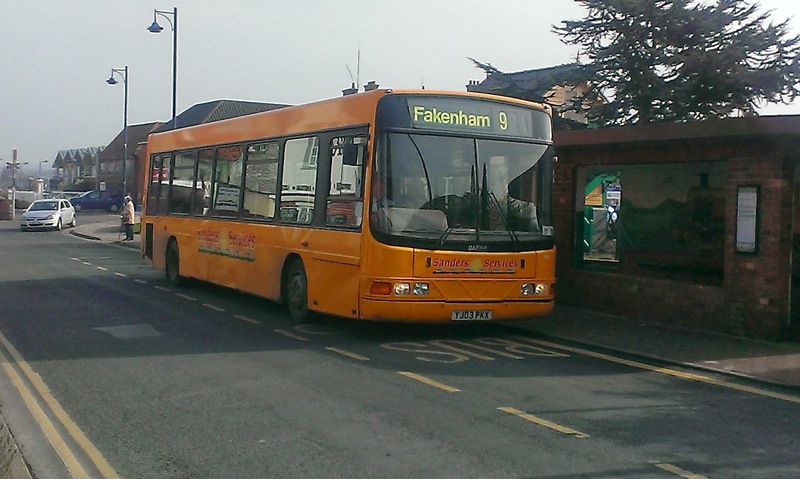 However I'm delighted to report that from 20th April the 1620 from Lowestoft will be extended to Halesworth Mon - Sat. I, for one will be a regular on it as it will give me the choice of pick ups by Suffolk Links whereas now if I go back that way I have to be picked up at Wangford. Thanks, Anglian! 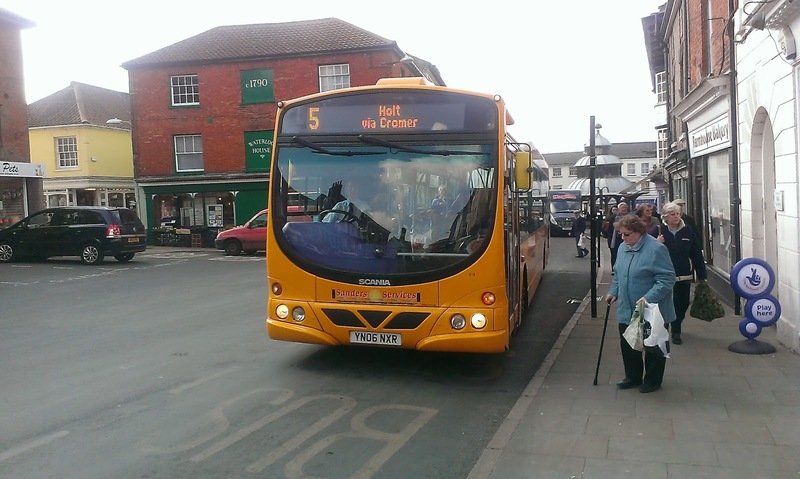 It's not so good news though if you're going the other way as the 1551 journey from Halesworth is now incorporated into a school contract which means the general public can't get on it. I can only assume no one ever caught it. I know there are other changes to Anglian services in April and I'll announce them as and when I know. 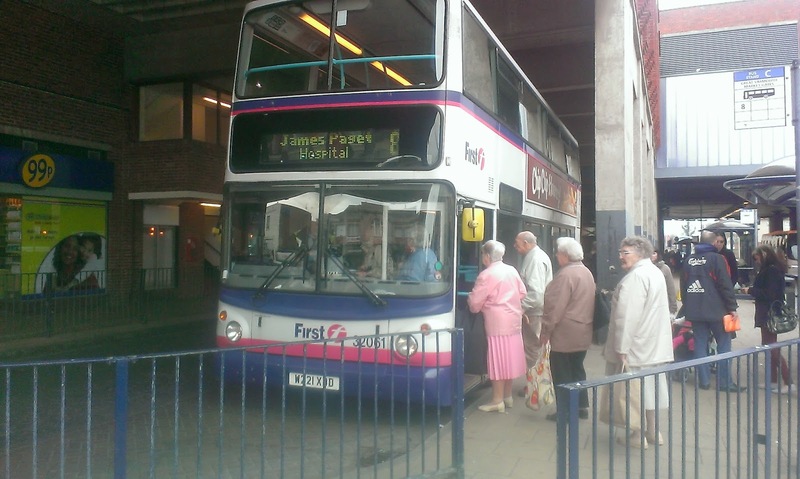 The 60 is largely unchanged except a later journey to and from JPH in the afternoons, and virtually no change to the 61. Nipped to Tesco this morning. That now takes 3 hours. Caught the Transit tin can at 0953 to Saxmundham, but no bus back till 1232 so went to Wickham Market for an hour to see a friend and raid the best butchers in East Anglia. 65675 one way, 65630 the other. Enough said. Got home at 1252. Then they wonder why people use their cars. Roll on Monday - might get on an Olympian and wash the grumpiness away!! It has not been a good day so far and it seems I have chosen the right day to stay in! The tragic helicopter crash in Gillingham last night has caused multiple road closures in the area, which has severely affected services. The X2, as I type is still not serving Gillingham and is diverted and experiencing severe delays - bet there are a few unusual vehicles on it today though! 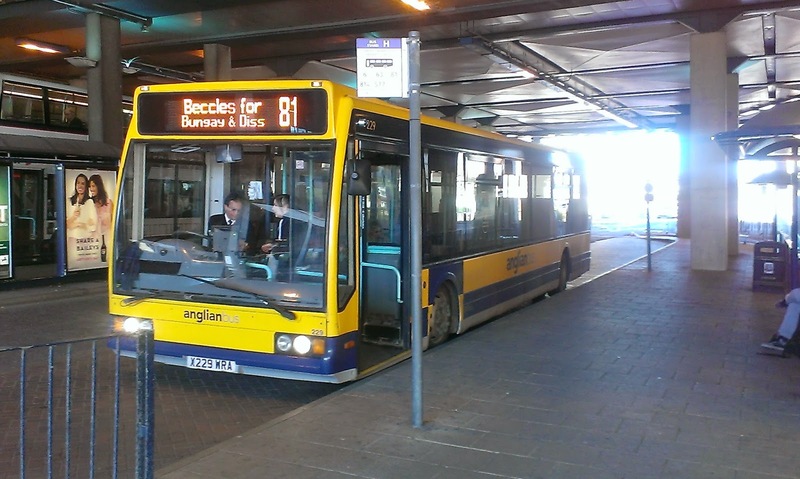 Anglian's 81 from Beccles to Yarmouth is suspended, and the 80 is only running from Diss to Broome. The Acle straight was closed earlier due to a RTC, and that meant the X1 and 7 were severely disrupted, with knock on effects to the 61. Add that to the report that the "short set" failed this morning and it has not been good. 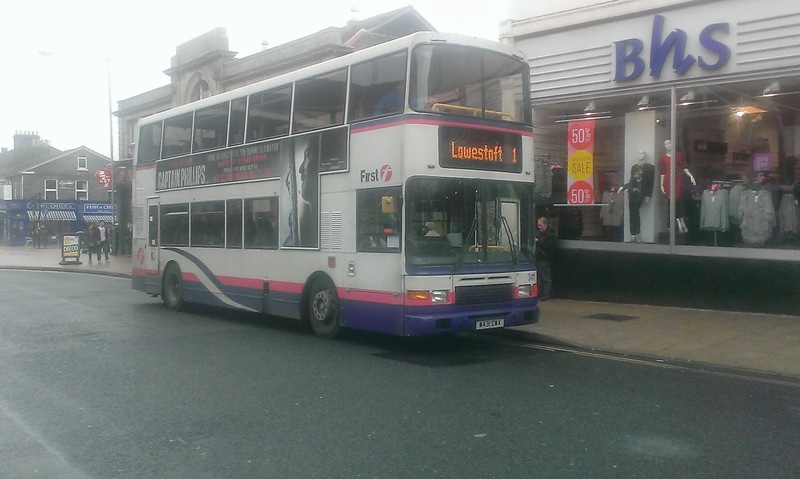 Looking at the various twitter and web updates it appears First Lowestoft really excelled themselves this morning getting the X2 running so well done to them. Anglian are constantly updating their website news feed too. What with the chaos in Lowestoft on Wednesday with the bridge works I think a lot of transport managers will need their weekend off this week. Obviously thoughts are with the families of those killed in the helicopter crash but I can't help thinking had 4 people been killed in a car crash the roads would have been open as soon as possible and not nearly the same amount of caution and investigation would have taken place. Maybe it's me being churlish but do fatalities involving light aircraft cause far more disruption than necessary? Just my not so humble opinion. Took a trip to Sheringham, and it was all meant to be about Sanders today, but as is always the case someone will throw a curve ball and all the plans go to pot. 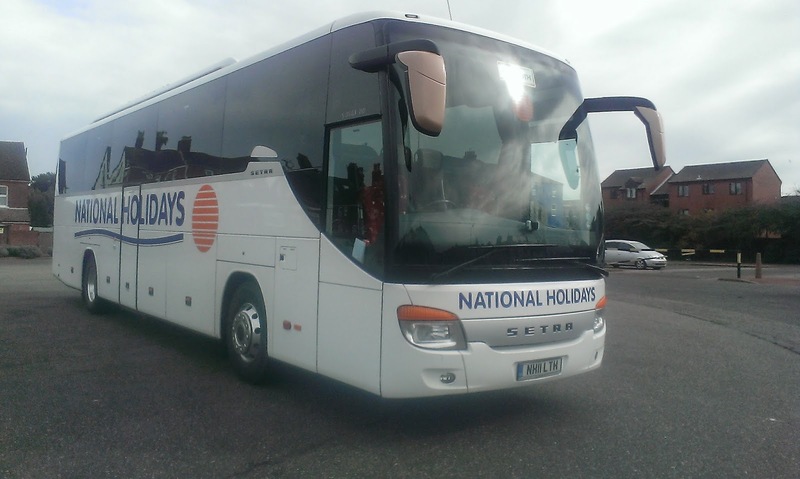 This happened today not 5 mins out of Norwich while travelling on "Goliath", one of Sanders 102 seater Volvo B9tl's. 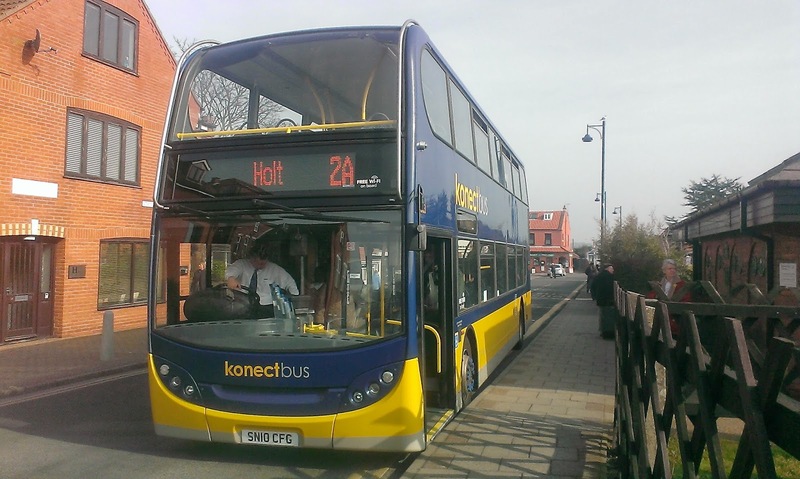 Konect's rival 2 service is normally operated by Optare Excels, with the odd Loyne bodied Trident. 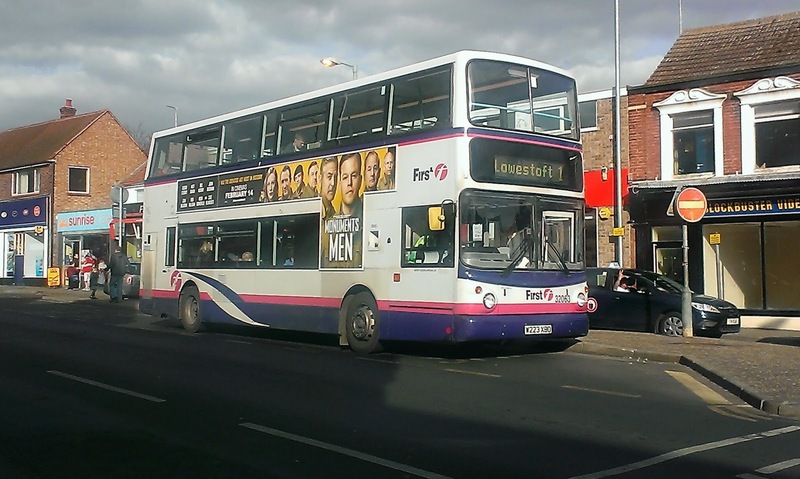 Today though one of their Konect Bus liveried E400's was on the 2, the first one I have seen - so much so I thought I had spotted something new and original. Oh well that bubble has been burst but it is still a rarity on the 2's! 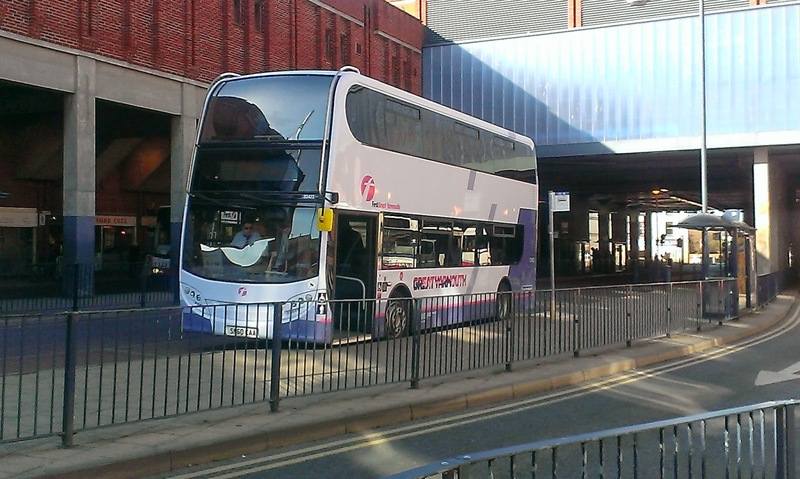 Anyway it was my first trip on the X44 and I thoroughly enjoyed it. 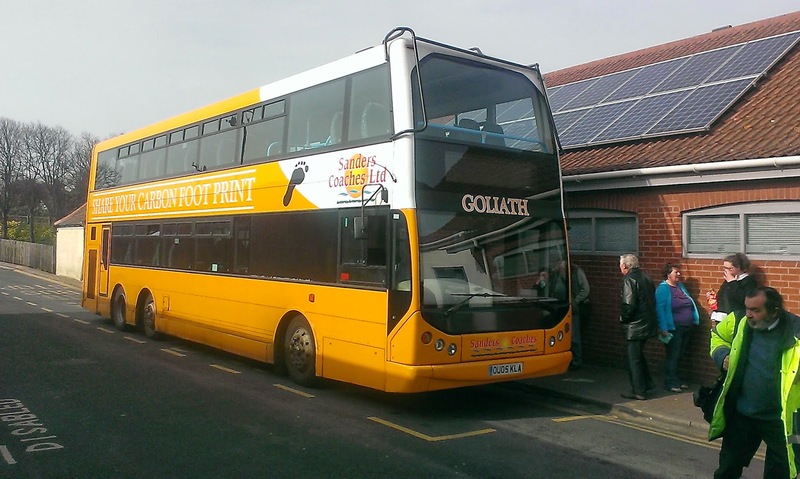 Goliath is not a lumbering giant, and gives a really decent ride - and according to the driver can provide a real turn of speed when "he" needs to! 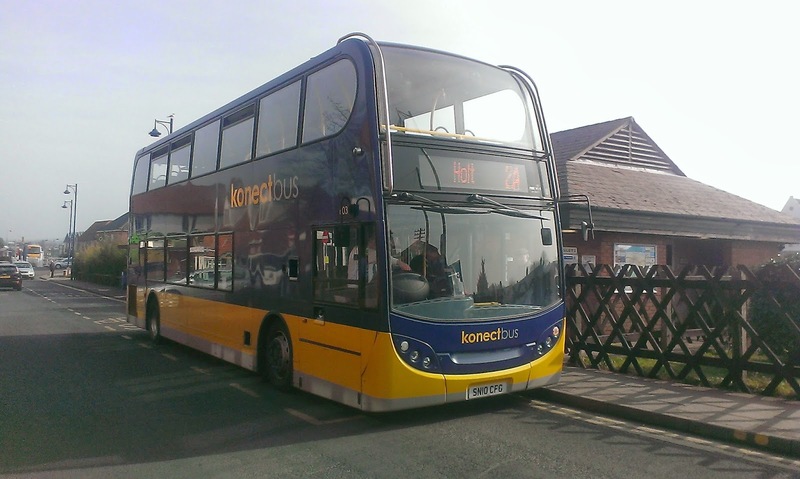 I got some good pics in Sheringham but couldn't resist travelling on Konect's 503 back to Norwich, and for an E400 it gave a seriously good ride - arguably the best journey I have had on an E400. As the weather improves I'll do a bit more in North Norfolk and Sanders in particular. As alluded to yesterday I had one of those days where I could have stayed in bed and not missed a thing. Apart from 3 hours in the company of Roy, that is, who literally saved the day. 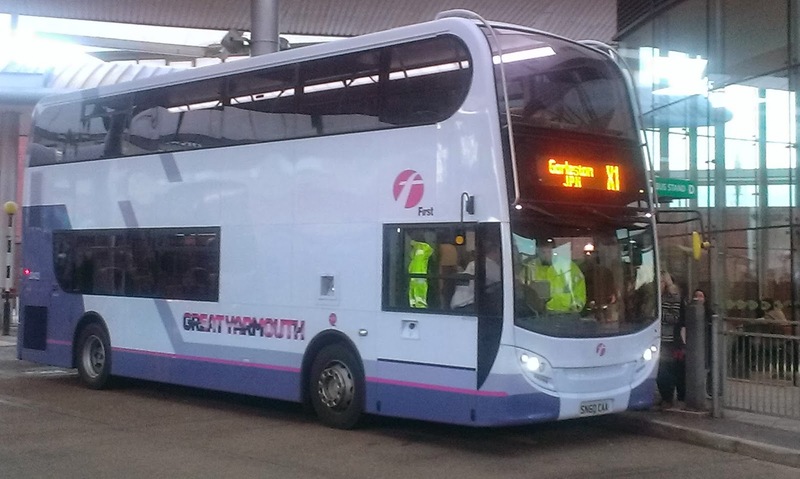 We tried everything to elicit some excitement, but not even a walk to Beach Coach station to take a pic of the usual Olympian and maybe ex Leicester ALX400 produced anything more than two Presidents not even worth taking a picture of. 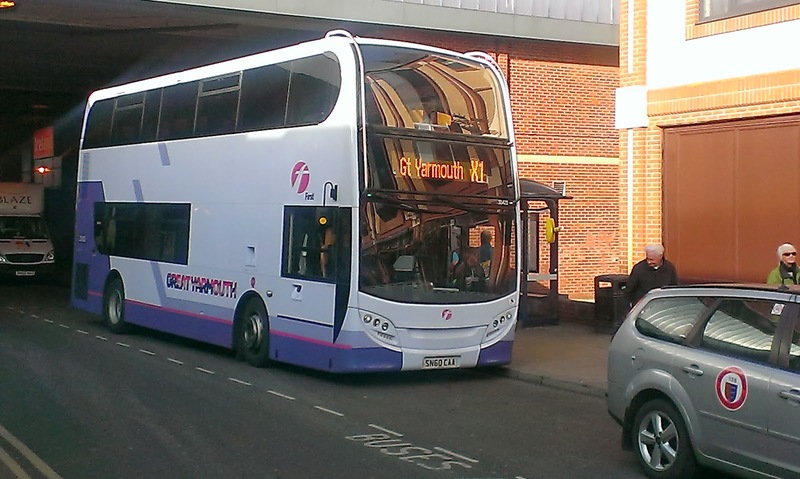 Below is the most exciting thing to happen in Yarmouth yesterday afternoon - 33423 using the stop on the public road at Market Gates to unload rather than the bus station itself. 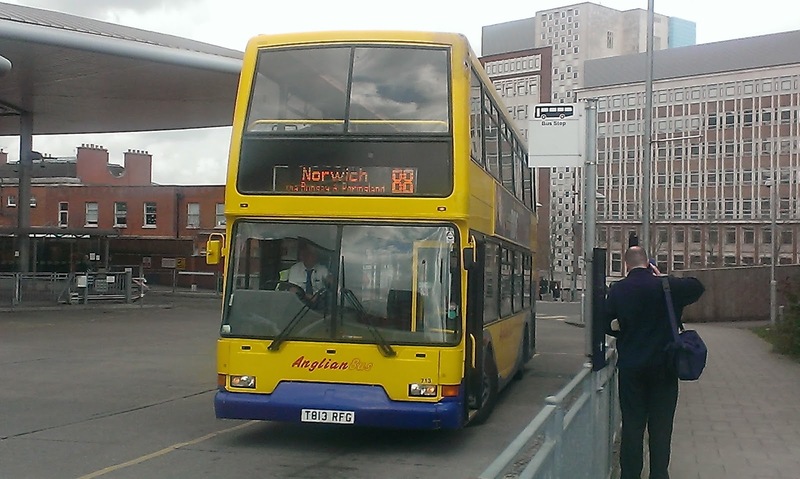 However, before I arrived at Yarmouth I had varied my usual route and travelled via Norwich, purely because Anglian had provided one of their older Omnicity Scanias - in fact their oldest - in the 88 instead of the usual bum numbing 07 reg Scania. 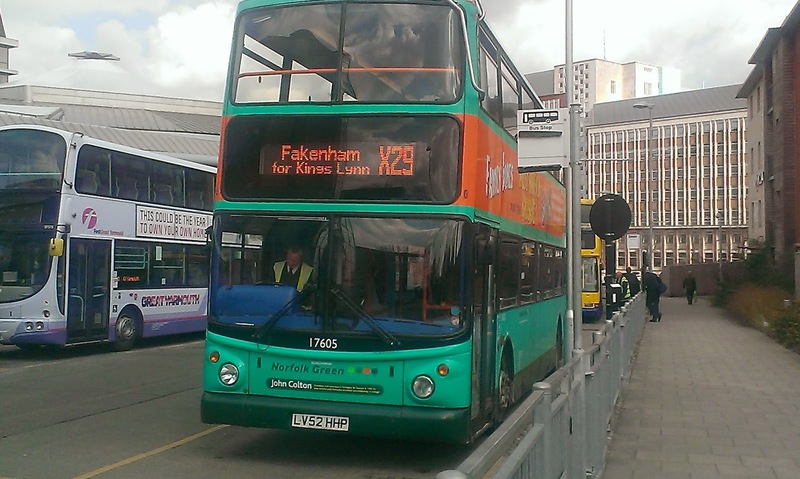 462 gave a decent ride into Norwich, where I was lucky enough to get a decent photo opportunity involving two Solos. I don't normally bother with Solos, but this was a good one - recently repainted Konect Solo 952 passing it's still in Anglian colours sister 951. Tomorrow I'm exploring the Sanders network so expect some pics of some very big deckers!! BTW I haven't forgotten the promised Olympian Specials. However I always said they would start when all the Olympians at Yarmouth had been withdrawn. 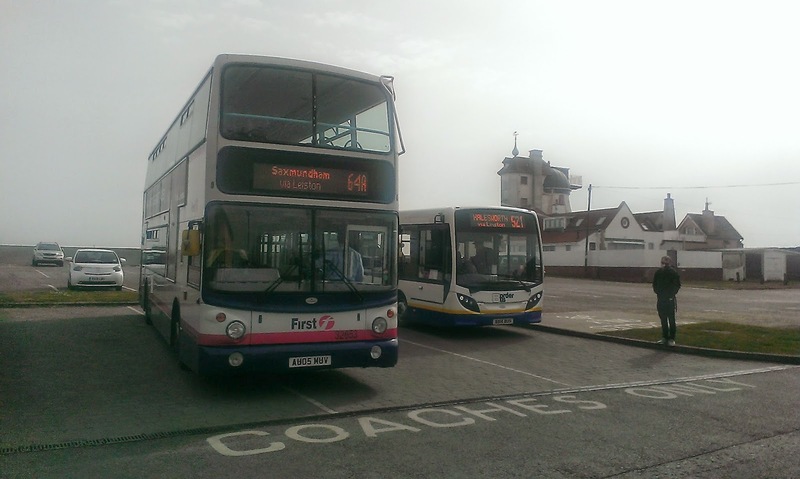 Happily with 3 Olympians at Yarmouth still in service this has meant a delay in the articles. Thanks to all who sent me pics and they WILL be used in the special features as and when they begin. I was going to post about the ridiculously uneventful day I had today - when the highlight is seeing a bus use a stop it doesn't normally use you know it is one of those days! 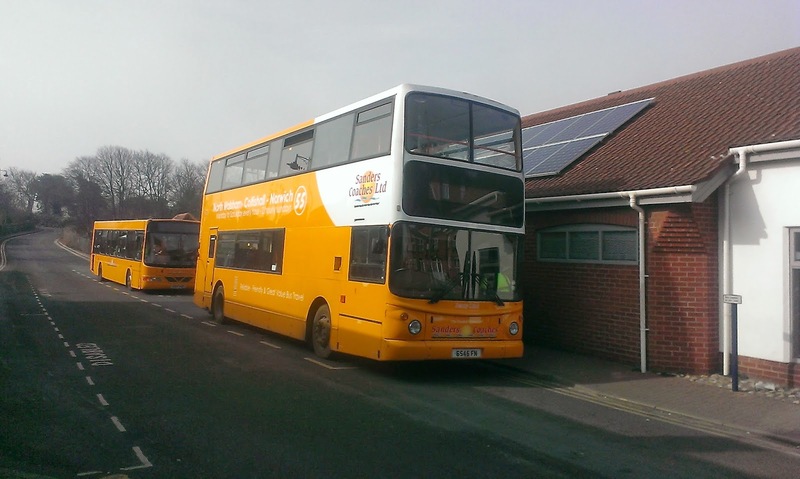 If I hadn't spent the afternoon with Roy Northcott from East Norfolk Bus Blog I would have gone stir crazy! But that can wait until tomorrow. I have just switched on the news to hear that Bob Crow, the General Secretary of the Rail, Maritime and Transport Workers Union has died at the pathetically early age of 52. 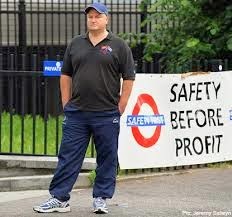 Most people have had reason to curse Bob Crow over the years, as it seems there has been an incessant flow of strikes on the railway since he took over. Well 12 years ago, when I was a Conductor on Southeastern I was on the picket line myself. 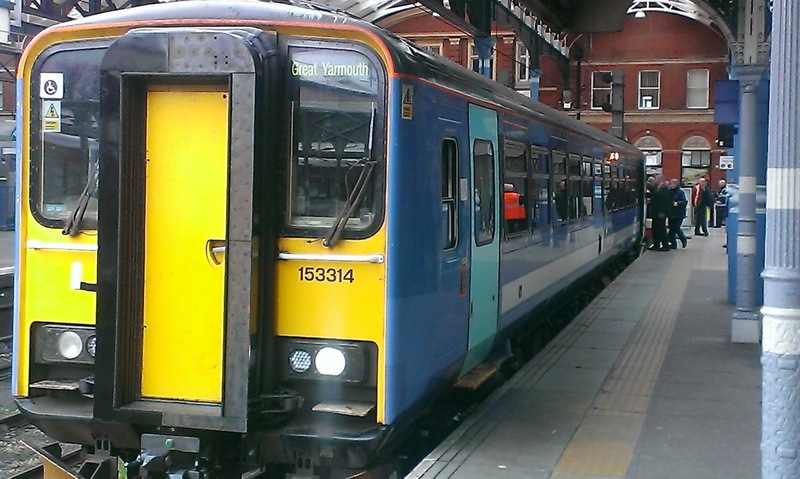 Southeastern had proposed turning more of the network DOO (Driver Only Operation) and we were fighting for our roles, responsibilities and jobs. Bob Crow personally supported our stance, and we reached a satisfactory compromise where no jobs were lost and there was no increase in trains without a Conductor. I have no doubt that without Bob Crow the working conditions of ALL railway workers would be a lot worse, and there wouldn't be nearly the number of staff there are. Yes, Bob could be beligerent at times, downright bloody minded at others, and the strikes have inconvenienced millions. But to get results sometimes you have to play dirty, tough and above all stand firm, and Lord knows what state the railway would be if it hadn't been for him. I very much doubt we will see a Union leader like Bob Crow again. Rest in peace, brother. This week I am asking you for your favourite livery. I have included as many companies as I can think of and this time hope I haven't left anyone obvious out. 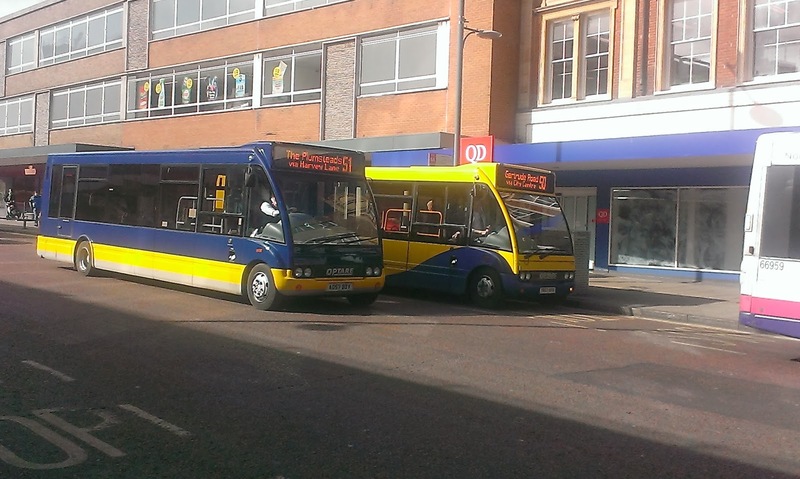 The Anglian livery to vote for is the one on the huge majority of their vehicles still, not the new one on only the two Optare Excels. 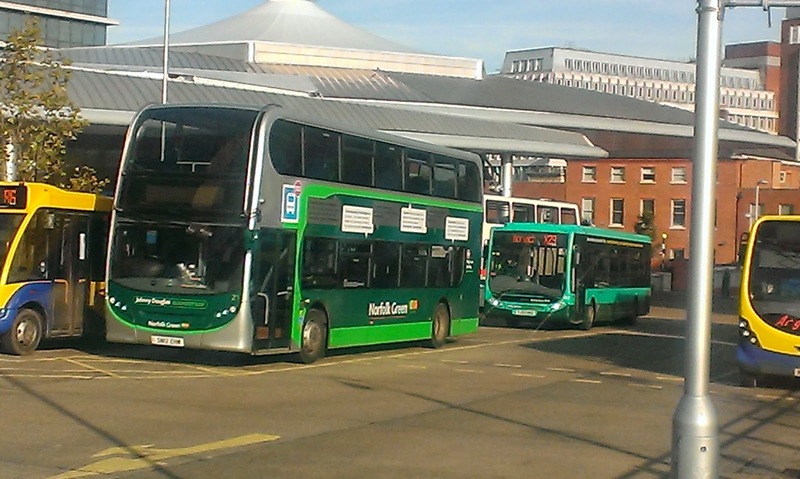 The Konect livery applies to the one on the newer vehicles, and Norfolk Green to their new one. You can vote for as many as you like on this one. Results next week. After waiting some time 32063 came around the corner going back to Yarmouth. I took a pic and boarded it. Now for the review. 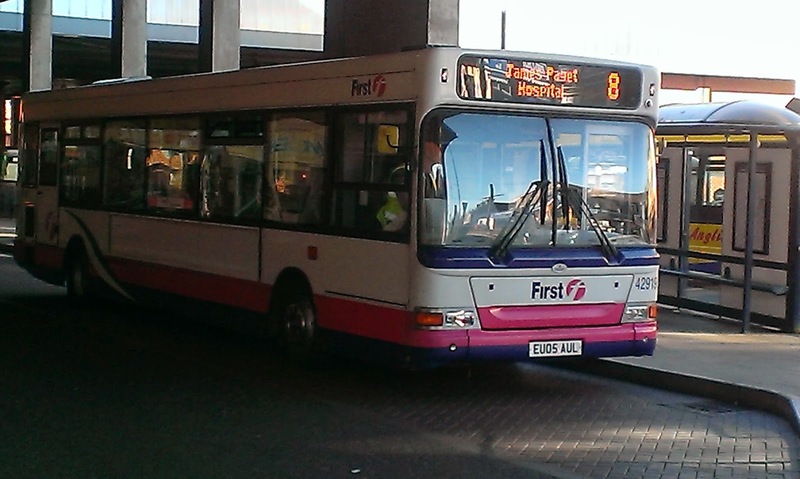 It is basically a vehicle deemed past it at Leicester so my expectations weren't unduly high. It could have been worse. It seems to go pretty well, the seats are better than the Presidents in that they have a minimum of padding as opposed to no padding, and the rattling is what you would expect of a 15yo vehicle, except of course 34109 is the same age and doesn't rattle at all. I worked out that if I went straight back to Gorleston I could do the repeat journey on 32062, so as I just missed 37578 which was also on the 8's today I was forced to catch 33811 instead which I really wasn't happy about but needs must. So I got to Gorleston and waited. And waited. And waited some more. Half hour later a President came round the corner. 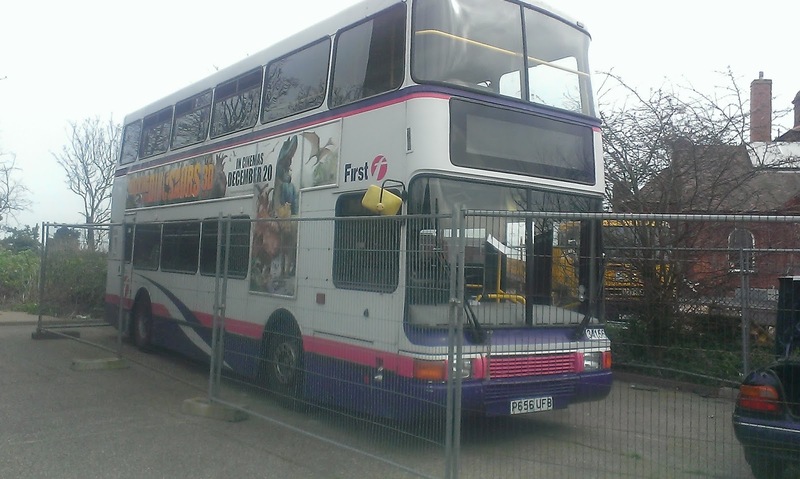 Seems 32062 had gone awol presumed failed somewhere, so I didn't get either my pic or ride of her today. So I caught the President (no idea which one) back to Yarmouth noting that it was even rattlier than 33811, before getting on my third gas bus of the day - caught four in total today - 100, 103, 109 and 111. I'm out again tomorrow and hopefully will have a bit better luck. 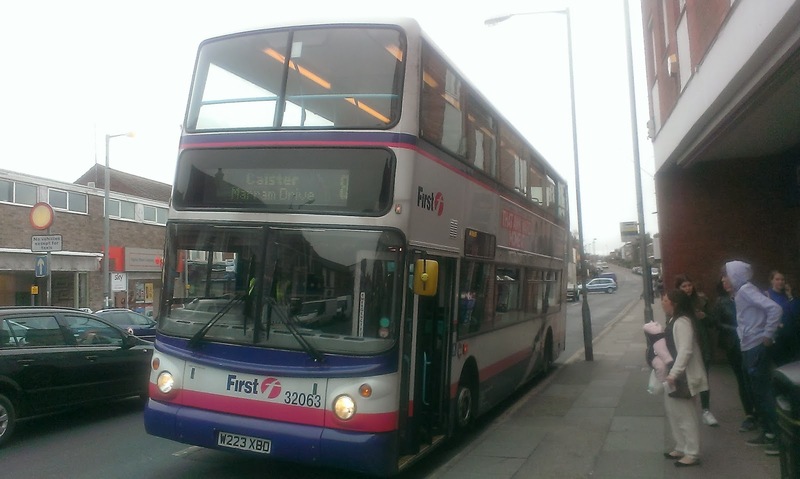 If anyone knows what happened to 32062 this afternoon then let me know as it was blooming cold in Gorleston!